Background: Habits formed in childhood dictate lifestyle choices made as adults. These encompass both oral hygiene and dietary habits which in turn affect dental caries status. Children largely acquire these habits from modeling/observing parents and other family members. Aim: The purpose of this study was to assess the caries status of 5-year-olds, and evaluate associations between dental caries and family-related factors. 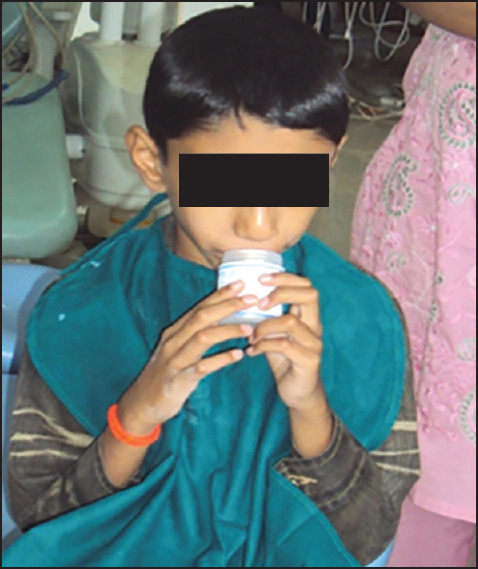 Materials and Methods: A cohort of 400 children were examined for dental caries using the WHO criteria. Parents were interviewed using a self-structured questionnaire to collect data with regard to variables under evaluation. Statistical analysis: Collected data was subjected to descriptive analysis using the SPSS 12.0 version. Risk factor association with dental caries was investigated using a stepwise logistic regression analysis with P-values < 0.05 considered significant. Results: Fifty nine percent of children suffered from dental caries. Statistically significant risk indicators for a child having dmft > 0 were: Mother with low basic education (OR = 1.3), higher number of siblings (OR = 1.4), high snacking frequency (OR = 2.0), parental inability to control sugar consumption (OR = 1.0) parental laxness about the child's tooth brushing (OR = 1.5), parents brushing their own teeth less than twice daily (OR= 2.0) and unassisted brushing by the child (OR = 1.8). Conclusion: It is thus mandatory to focus on parents' education level, attitudes and family-structure when planning preventive programs for young children. Background: Dental treatment can be highly unpleasant for anxious patients. Despite all advancements, dental anxiety continues to upset the dentist-patient relationship. The psychological factors like individual personality and familial and peer influence may alter the dental beliefs of a patient. Aim: A cross-sectional questionnaire study was conducted among young adolescents to investigate the relationship among various psychological factors and the dental beliefs of an individual. Materials and Methods: A self-administered questionnaire was distributed among higher secondary school children, aged 15−17 years in Udupi district. The dental anxiety of the participants was measured using Modified Dental Beliefs scale and the personality traits were assessed using the Ten-Item Personality Inventory. Pearson's correlation and chi-square analysis were performed among these scales. Independent t-test was performed to compare dental anxiety scores with different socio-demographic and psychological characteristics. Results: In all 198 students, with a mean age of 16.6 years, completed the questionnaire. A majority of the participants had lower MDBS scores. The personality traits like Emotional Stability and Openness to New Experiences showed a negative correlation with the Dental Belief scores. Apart from these, the experience at first dental visit and peer support also affected the dental beliefs of the adolescents. Conclusion: Various psychological traits of adolescents influence their dental anxiety. Background: Fear and pain are the factors producing stress and there is evidence that dental fear acquired in childhood may persist to influence adult behavior. Dental treatment is often considered as anxiety producing and stressful. Aim: To assess the levels of stress displayed by the healthy children undergoing routine dental procedures like oral examination, restoration, and extraction by analyzing salivary levels of cortisol before, during, and after the procedures. Materials and Methods: Twenty healthy children aged between 4 and 8 years having their first dental visit and requiring at least one restoration and one extraction were selected. In each patient, three procedures were carried out: (i) Routine dental examination, (ii) restoration, and (iii) extraction. Unstimulated salivary samples were collected 10 min before, during the procedure, and 30 min after each procedure at three different visits for comparison of cortisol production in response to anxiety and stress over time. Total 180 samples were collected to determine salivary cortisol levels using UBI-MAGIWEL TM kit and the readings were noted. Statistical Analysis Used: Statistical Package for Social Sciences (SPSS) software with paired t-test, two independent sample t-tests, and analysis of variance (ANOVA) were used to analyze the findings. Results: A correlation between salivary cortisol and stress in dental procedure was noticed. Cavity preparation is more stressful procedure in children, so alternative methods can be used in anxious children. Stress associated with extraction persists to a postoperative period. No correlation exists in between Corah's anxiety scale and salivary cortisol. Background: The predictors of missing data when parents fill out questionnaire about their children's diet are not defined. The aim of this study was to evaluate predictors which affect unresponsiveness to diet questions based on " Oral Health Situation of Iranian Children" Survey carried out in 1998. Materials and Methods: A dummy variable was created as dependent variable according to responding eight questions relating to diet. Then predictors of missing data were defined using multivariable logistic regression and classification tree method. To evaluate goodness of fit of logistic regression model, sensitivity and specificity were assessed. 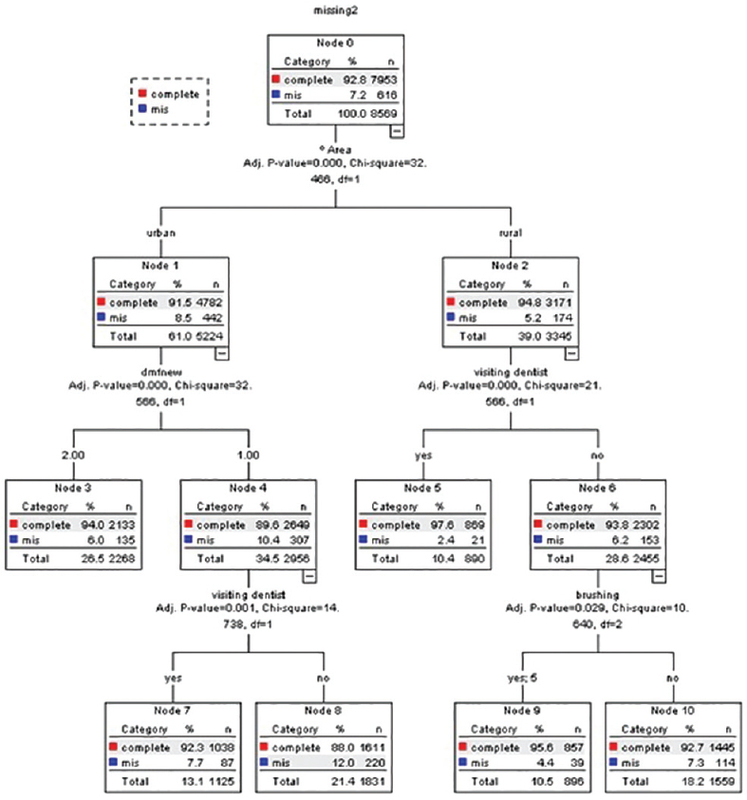 Classification tree analysis was done by Quest growing method. Significance level was set at 0.05 in logistic regression analysis. Observations and Results: "Missing data" variable was marked as missing in 616 (7.2%) of questionnaires. In logistic regression model revealed that, gender, mother's education level and father's education level didn't affect "missing data" variable (P > 0.05). But, dmf index (OR = 0.94), Area of living (OR = 0.49), number of children in the family (OR = 1.19), sibling order (OR = 0.85), brushing (OR = 0.84) and visiting dentist (OR = 0.59) had statistically significant association with dependent variable (P < 0.05). Classification tree analysis showed that questionnaires related to children in urban area whose dmf index is under 5 and haven't visited dentist are predicted to have missing data more than other groups. Conclusions: Area of living, dmf index, number of children in the family, sibling order, brushing and visiting dentist are significant variables for predicting the risk of missing data when asking parents about their children's diet. Objectives: Clinical and radiographic effects of mineral trioxide aggregate (white MTA) and calcium hydroxide (Dycal) in indirect pulp treatment (IPT) of primary teeth over a period of 6 months. Materials and Methods: A clinical trial with sample size of 40 primary molars between the age group of 5-9 years, of which, 20 teeth were considered, each for MTA and Dycal. Measurements on the digitized radiographs were performed at baseline, third and sixth month, increase in dentin was then measured using Corel Draw software. Result: Independent t-test had indicated that at the end of 3 months and 6 months, a statistically significant increase in dentin thickness with both MTA and Dycal (P-value ≤ 0.001) was found. Within the MTA group, the thickness of dentin formed was 0.089 mm ± 0.031 mm at first 3 months and 0.055 ± 0.022 mm at the second 3 months, (P ≤ 0.001) evaluated using paired t-test. In the Dycal group, increment in dentin deposited was 0.068 mm at the first 3 months and second 3 months, it was 0.030 mm (P-value ≤ 0.001). Conclusion: Clinically and radiographically, MTA is superior to Dycal as a good IPT medicament in primary teeth. Background: Anomalies and enamel hypoplasia of deciduous dentition are routinely encountered by dental professionals and early detection and careful management of such conditions facilitates may help in customary occlusal development. 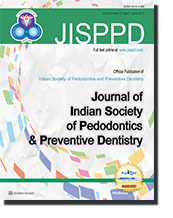 Objective: The aim of this study was to determine the prevalence of hypodontia, microdontia, double teeth, and hyperdontia of deciduous teeth among Indian children. Materials and Methods: The study group comprised 1,398 children (735 boys, 633 girls). 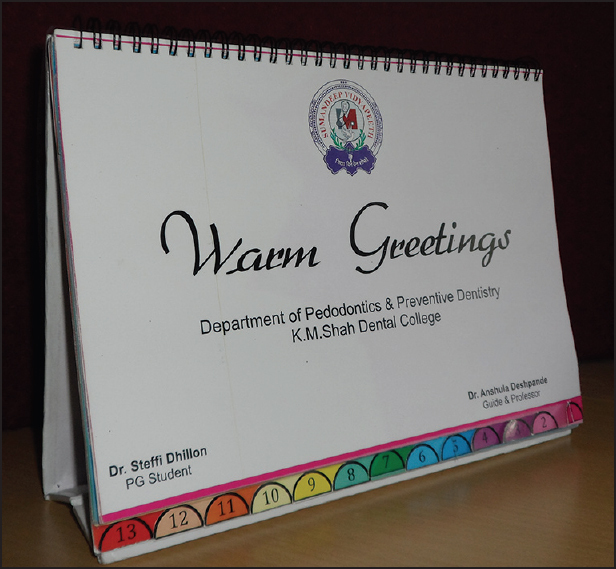 The children were examined in department of Pedodontics and Preventive Dentistry in Jodhpur Dental College General Hospital, Jodhpur, Rajasthan, India. Clinical data were collected by single dentist according to Kreiborg criteria, which includes double teeth, hypodontia, microdontia, and supernumerary teeth. Statistical analysis of the data was performed using the descriptive analysis and chi-square test. Results: Dental anomalies were found in 4% of children. The distribution of dental anomalies were significantly more frequent (P = 0.001) in girls (5.8%, n = 38) than in boys (2.7%, n = 18). In relation to anomaly frequencies at different ages, significant difference was found between 2 and 3 years (P = 0.001). Conclusion: Double teeth were the most frequently (2.3%) observed anomaly. 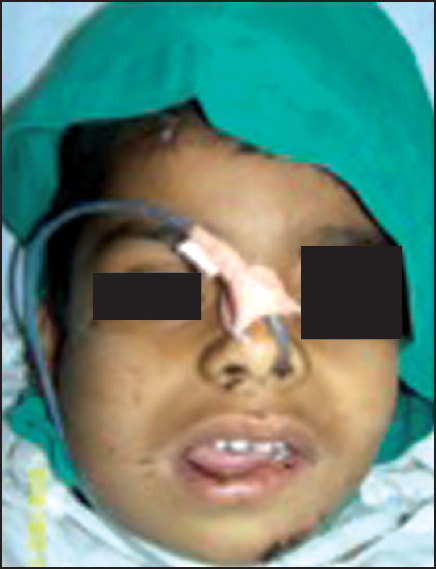 The other anomalies followed as 0.3% supernumerary teeth, 0.6% microdontia, 0.6% hypodontia. Identification of dental anomalies at an early age is of great importance as it prevents malocclusions, functional and certain psychological problems. Purpose: The study was conducted with the aim of comparing the shear bond strength (SBS) and microleakage of Tetric N-Bond, G-bond, and Xeno V (seventh generation dentin adhesives) in primary anterior teeth. Materials and Methods: For the shear bond strength, 45 teeth were randomly divided in to three groups namely group A, B, C (n = 15). Samples were mounted horizontally on acrylic block exposing the facial surface and bonded with different adhesives according to manufacturer instructions. A split Teflon mold was used to build the composite resin cylinder and light cured. Shear bond strength was tested using a universal testing machine. The values were statistically analysed. For microleakage, another 45 teeth were similarly grouped. Two class V cavities were prepared on the labial surface and treated with different dentine bonding agents and restored with resin composite (Ivoclar vivadent) A2 shade. The restorations were subsequently thermally stressed for 200 cycles and were subjected to dye penetration test, followed by sectioning through the center of the restoration labiolingually. Each section was examined using stereomicroscope at × 40 magnification to asses dye penetration at the margins of the restoration. Results: The SBS varied between 22.12-23.77 N/mm 2 (P-value = 0.231). The microleakage scores varied between 0.6-1.2 (P-value = 0.03; Post-hoc test A vs B (0.007)).There was a statistically higher degree of microleakage observed in group A when compared to group B. Conclusion: Among the three commercially available bonding agents, there were no statistically significant differences in SBS. G bond had higher microleakage when compared to the others. Context: Gynecologists the Primary Health Care providers, for pregnant mothers bear the unique responsibility to detect and diagnose oral health problems for timely and effective interventions. Aim: The aim of the study was to assess the impact of Perinatal Oral Health Care (POHC) education program on the knowledge, attitude and practice behavior amongst Gynaecologists of Vadodara City. Settings and Design: An analytical cross sectional study was conducted amongst Gynecologists practicing in Vadodara city, registered under Indian Medical Association (IMA), Baroda, Gujarat. Materials and Methods: A validated questionnaire survey was conducted to establish a baseline level of knowledge, attitude and practice behavior of 46 Gynecologists. After that education and awareness regarding POHC to Gynecologists was provided with the help of flip charts and resource brochures. To determine the impact of recent provision of education and awareness a post-test was conducted. Statistical analysis used: Data was analyzed by paired t-test using the SPSS Version 20. Results: The results after evaluating the data from pretest and posttest showed a mean increase of correct answers in knowledge (from 7.304-9.891; P = 0.00), Attitude (from 3.978-4.108; P = 0.49) and practice behavior (from 4.130-5.521; P = 0.00) in POHC amongst Gynecologists following the education program. Conclusions: It can be concluded that there is a need for provision of education and awareness to the primary health care providers which would help in improving pregnant women and infant's oral health status along with establishment of dental home. Background: Previous investigations showed that a high-molecular-weight, nondialyzable material (NDM) from cranberries inhibits the adhesion of a number of bacterial species and prevents the coaggregation of many oral bacterial pairs. Aim: In the present study, the effect of mouthrinse containing high-molecular-weight component of cranberry was evaluated on colonization of Streptococcus mutans in children and compared it with a control mouthrinse without high-molecular-weight component on Streptococcus mutans counts. Materials and Methods: A high-molecular-weight NDM was isolated from cranberry juice concentrate after the dialysis of the cranberry concentrate; followed by lyophilization. A mouthwash was prepared especially for the study having NDM in the concentration of 3 mg/ml. Following 4 weeks of daily usage of cranberry-containing mouthwash by the children of an experimental group (n = 20), the Streptococcus mutans counts in plaque and saliva were compared with that in control group using placebo mouthwash (n = 20) with the help of Dentocult SM strips. Results: There was a highlysignificant reduction in Streptococcus mutans counts in saliva and plaque of children using mouthwash containing cranberry NDM (P < 0.05) compared to control. Conclusion: The data suggest that the high-molecular-weight cranberry extract in mouthwash has a significant potential in reducing the Streptococcus counts in the oral environment. Aim: Rapid phylogenetic and functional gene (gtfB) identification of S. mutans from the dental plaque derived from children. Material and Methods: Dental plaque collected from fifteen patients of age group 7-12 underwent centrifugation followed by genomic DNA extraction for S. mutans. Genomic DNA was processed with S. mutans specific primers in suitable PCR condtions for phylogenetic and functional gene (gtfB) identification. The yield and results were confirmed by agarose gel electrophoresis. Results: 1% agarose gel electrophoresis depicts the positive PCR amplification at 1,485 bp when compared with standard 1 kbp indicating the presence of S. mutans in the test sample. Another PCR reaction was set using gtfB primers specific for S. mutans for functional gene identification. 1.2% agarose gel electrophoresis was done and a positive amplication was observed at 192 bp when compared to 100 bp standards. Conclusion: With the advancement in molecular biology techniques, PCR based identification and quantification of the bacterial load can be done within hours using species-specific primers and DNA probes. Thus, this technique may reduce the laboratory time spend in conventional culture methods, reduces the possibility of colony identification errors and is more sensitive to culture techniques. Context: Electric pulp testers (EPTs) are widely used as diagnostic aid in dentistry for dental pulp. This delivers enough current to overcome enamel and dentin resistance and to stimulate the myelinated sensory ﬁbers at the junction of pulp and dentin. Such testing requires the electrode to be in contact with the surface of the tooth, with optimal positions identiﬁed for anterior teeth, premolars, and molars. Aims: To determine the best site position of EPT on premolars. The objective of electric pulp testing was to determine the sensibility of each premolar at the lowest sensory response threshold. Settings and Design: Clinical study Materials and Methods: The premolars of 20 patients between 13 and 15 years accompanied with parents, free of restorations, and caries were selected. Five sites on the crown were tested with EPT for minimum of four times. Statistical analysis used: One-way analysis of variance test and the Tukey's honestly significant difference test. Results: The lowest threshold response was noted at the incisal edge of the tooth; the middle third had a higher threshold among all the different placement of electrode. Statistically significant difference was observed for occlusal surface in terms of region of placement of electrode. Conclusions: This experiment found the best electrode site for pulp testing in premolars. The appropriate EPT site was on the occlusal surface of maxillary and mandibular premolars. Background: Analgesics such as Ibuprofen and Paracetamol, which are clinically used for the treatment of fever and/or pain, are among the most frequently used pediatric medicines. However, the properties of these preparations determine their cariogenic and erosive potential. Aims: The main objective of this study was to analyze the pH, viscosity and total sugar content in a variety of Syrian pediatric liquid analgesics (PLA). Setting and Design: A total of 16 available liquid analgesics that belong to the Paracetamol and Ibuprofen group were analysed. Materials and Methods: The endogenous pH was measured using a digital pH meter, the viscosity was measured using a digital rotational viscometer and the total sugar content was performed according to Fehling method. Statistical Analysis: Data were presented by means of descriptive statistics (mean, standard deviation, minimum and maximum values). Results: The mean endogenous pH of PLA was 4.63 ± 0.57 ranging between 3.93 and 5.68, and almost all of analgesics (93.8%) had pH values ≤5.5. The mean viscosity of PLA was 243.56 ± 186.6 cP and varied between 20.5 cP and 640.5 cP. Sugars were detected in 11 (68.75%) analgesics, and varied considerably among sugar-containing analgesics from 5.38 to 69.4 (g/100 mL) with a mean concentration of 24.97 ± 23.24 g/100 mL. Conclusion: PLA are potentially cariogenic and erosive because of low pH, high viscosity and high total sugar content. This may increase our concerns about the dental health of children who take liquid analgesics frequently or when long-term treatment is indicated. Crown fractures are most common form of dental trauma sustained by children and adolescents. Major portion of these crown fractures are uncomplicated. Complicated crown fractures though infrequent and account only 4-16%, is an enigma to any clinician. Autologus reattachment of the tooth fragment is a simple and conservative procedure in managing such crown fractures. 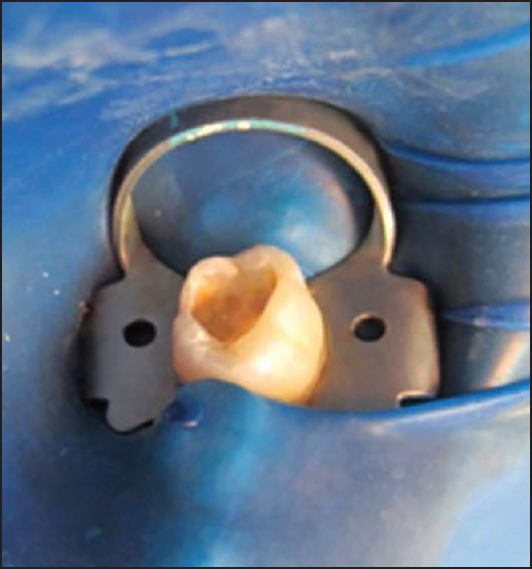 The present article intends to report the successful clinical management of Autologus tooth fragment reattachment in two complicated crown fractures. Molar incisor hypomineralization (MIH) is a defect in the tooth enamel of systemic origin and may affect one or all four first permanent molars frequently associated with the permanent incisors. This case reports a 7-year-old child with severe MIH in the permanent molars associated with tooth decay and intense pain. In the first stage of treatment, therapy was performed with fluoride varnish and restoration with glass ionomer cement (GIC). 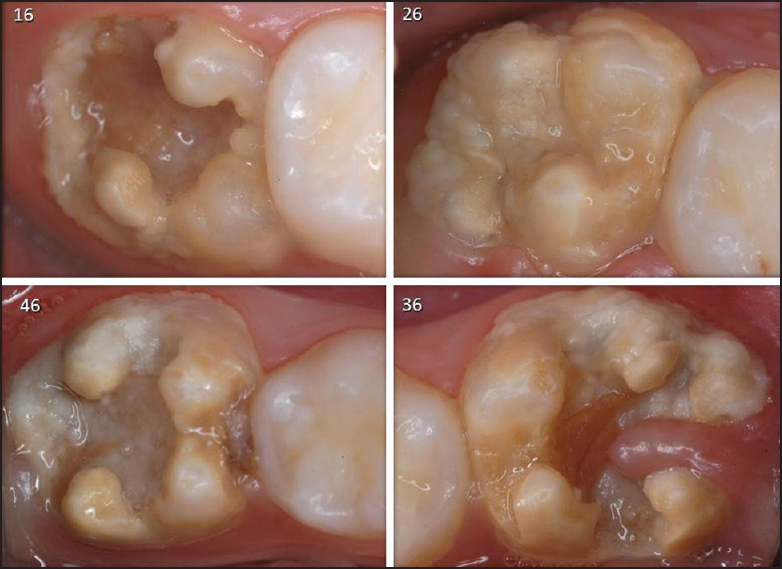 After 6 years of clinical and radiographic follow-up, the restorations presented wear and fractures on the margins, indicating their replacement with composite resin. 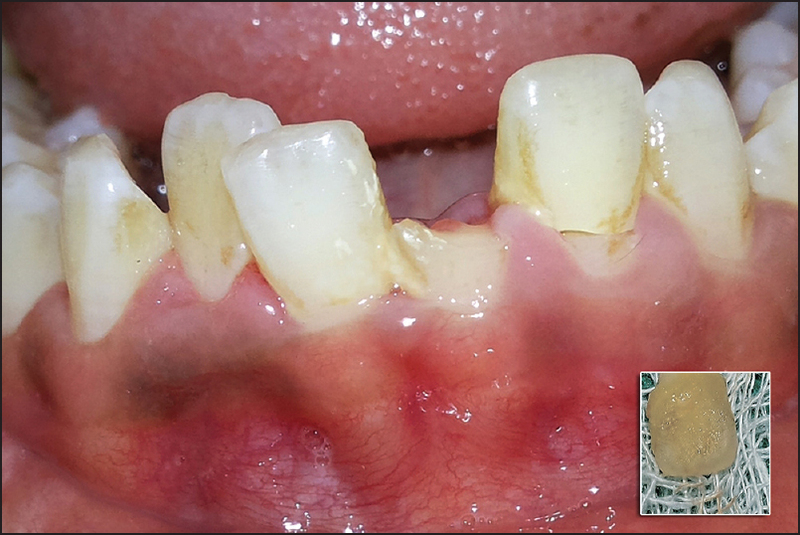 Severe cases of MIH in the early permanent molars can be treated with varnish and GIC to restore the patient's comfort and strengthen the hypomineralized dental structures. The clinical and radiographic monitoring frequently indicated when the restoration with composite resin should be performed. Aim: To evaluate the efficacy of open reduction and semirigid internal fixation in the management of displaced pediatric mandibular fractures. Method: Ten patients with displaced mandibular fractures treated with 1.5 mm four holed titanium mini-plate and 4 mm screws which were removed within four month after surgery. Results: All cases showed satisfactory bone healing without any growth disturbance. Conclusion: Open reduction and rigid internal fixation (ORIF) with 1.5 mm titanium mini- plates and 4 mm screws is a reliable and safe method in treatment of displaced paediatric mandibular fractures. Background: Ankylosis of the temporomandibular joint (TMJ) is an intracapsular union of the disc-condyle complex to the temporal articular surface that restricts mandibular movements, including the fibrous adhesions or bony fusion between condyle, disc, glenoid fossa, and eminence. It is a serious and disabling condition that may cause problems in mastication, digestion, speech, appearance, and hygiene. 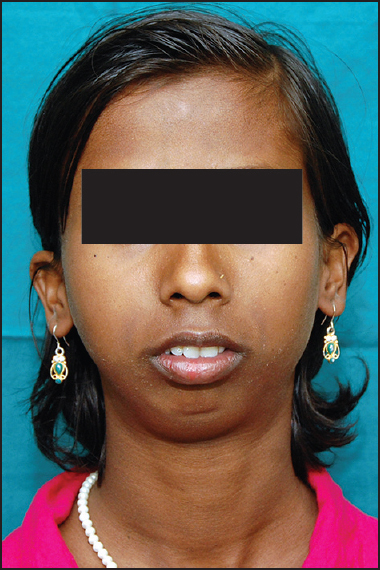 Case Report: This report describes a case of a 12-year-old girl with inability to open her mouth, diagnosed with unilateral right bony TMJ ankylosis. The surgical approach consisted of gap arthroplasty with interpositional temporalis muscle flap followed by vigorous physiotherapy. Conclusion: The treatment of TMJ ankylosis poses a significant challenge because of technical difficulties and a high incidence of recurrence. Its treatment includes the orthodontist, oral and maxillofacial surgeon, pediatric dentist, and psychologist and physical therapist as part of the healthcare team.